Flowing water presents a challenge for erosion and sediment control that requires planning and additional measures than just hydroseeding alone. Erosion control blankets and straw wattles are some of the products MCH uses for drains, ditches and steep slopes. Where there is likely to be some flowing water over an exposed area for a short period of time Erosion Control Blankets are recommended. ECBs protect the soil from rain splash and runoff allowing seed germination and quicker vegetation establishment. ECBs are fiber mulch (straw, coconut, or wood) sandwiched between two layers of propylene netting. They come in 4 – 16 foot rolls that can be put in place like carpets and tacked down. The ground is smoothed and pre-seeded prior to ECB placement. Straw wattles also known as sten logs are used to slow down runoff water and drop sediment out of the flow. 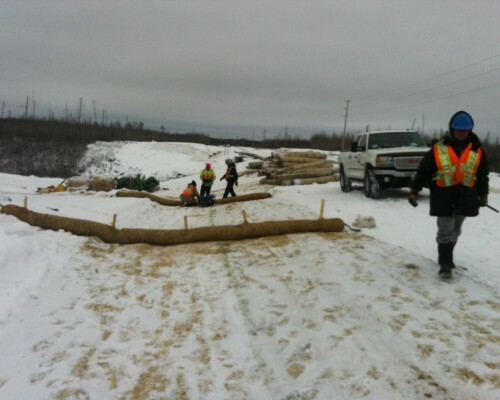 Sten logs are simply a polypropylene sock filled with various fibers (most commonly straw, but also wood, or compost), which is staked or pinned to the ground to create a speed bump for sediment laden water leaving a construction site. The straw filled wattles are 100% biodegradable and photodegradable and can simply be left in place to break down or they can be removed once the upstream site is vegetated.